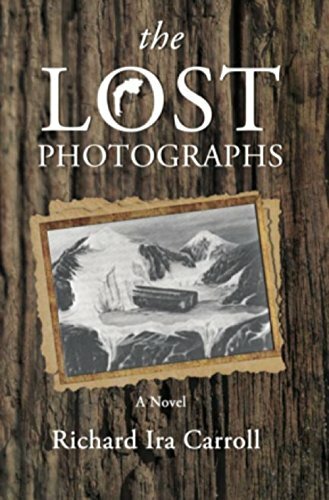 The Lost Photographs is an exciting adventure story that follows three adventurers as they set out to uncover the truth of Noah’s Ark. What was the inspiration that made you want to write this riveting novel? I have always been intrigued by the story of Noah’s Ark. Fuel was fed to that fire in the 1980’s when I watched a TV special about a team of Russian soldiers finding and photographing Noah’s Ark on Mount Ararat in 1916. I have thoroughly researched that story, and I believe it to be true. I think you did a a wonderful job of building interest with the backstory of the lost photographs of the ark. What kind of research did you undertake to get things right in this novel? 1. The above mentioned story. 3. Mount Ararat and the Ahora Gorge. helicopters to build a large complex over the site on a glacier above the Ahora Gorge. Your characters were exceptionally developed which made them endearing and fascinating. What were some themes you wanted to capture while creating your characters? First, I wanted to draw my readers quickly into the story when I wrote about Yuri and Jelena. Young love and tragedy set the stage for the rest of the novel. When Jelena peeks through the window and sees Yuri the fourteen year old boy she loves laying dead right before her eyes, it is heart breaking. I tied that story back a hundred years later when Matt, Ann, and Jim are in a Russian cemetery late in the night hoping they will not be caught digging up the dead. They shine their flashlight beams down into the coffin onto the face of Yuri. They then lay the five photos of Noah’s Ark on Yuri’s body as they turn each one over and gasp at the discovery. Those two scenes are essential. I wanted all of my present day characters to be totally dedicated to finding Noah’s Ark. That is their passion. I also wanted them to have fun. I created Jim’s character to be Matt’s best friend. I wanted them to be able to laugh and be able to tease each other and also to protect each other when needed as best friends do. The theme of the beautiful, talented, and dedicated Ann Tyler needs no explanation. My second novel, Burned in Stone, is a sequel to The Lost Photographs and is already published. Both novels have been awarded 4 stars by Literary Titan. I am extremely honored to have received those awards as a first time author. This is it! This is how all three of us will die because there’s no way I’ll ever cut the rope to save myself and send Jim and Ann to sure death. Terrified, he felt his fingers begin to slip down the ax handle. Dr. Matthew Lane has been in a lot of scrapes with his fellow archaeologist Jim Morgan. But neither is prepared for the trouble that lies in store as they search for what could be the biggest discovery in centuries. Matt is convinced that the testimony from the Russian soldiers who swore they photographed Noah’s ark protruding from the glacier in the summer of 1916 is true. They claimed all the documentation, measurements, description of the interior cages and photographs were turned over to the czar just before the revolution. A Russian immigrant, Ann Tyler, has carried her grandmother’s secret with her for more than a decade. She knows the hiding place of The Lost Photographs that could prove the existence of Noah’s ark. Has she finally found a trustworthy confidant? When Ann joins Matt and Jim to search for The Lost Photographs, they begin a journey none could have predicted. Richard Carroll deftly weaves together this fast-paced adventure based on the old stories of Russian soldiers discovering the ark on Mount Ararat. Uncover the enduring enigma of the ancient ark and the crusade to conceal the truth. This novel is based on a well-documented story that many people believe to be true. Matt and Jim are living out their lifelong dream to uncover and provide undeniable truth that Noah’s Ark did indeed come to rest atop Mt. Ararat. With the help of Ann and a tragic story of her grandmother’s first love, Matt and Jim begin their journey with stunning photographs of the ark itself which have been hidden from the world in the most ingenious way possible. Luck is not on the side of the three adventurers, however. One dangerous situation after another impedes their progress on the path to the top of Mt. Ararat. Richard Carroll has captured within the pages of The Lost Photographs a mere snapshot of the enormity of the task undertaken to uncover Noah’s Ark atop a frozen Mt. Ararat. His depiction of the dedicated team who undertakes this task despite all obstacles, both natural and incited by man, is riveting and tense. No one else has wanted anything more than Matt and Jim want to prove the existence of the ark, and absolutely nothing will prevent them from accomplishing what they have set out to do. I have always found the search for proof of the ark’s existence to be fascinating. The Lost Photographs does not focus quite as heavily on the actual ark as I would like to have seen. Though it does center around the hidden photographs and delves into the excavation of the site itself, the book also has a parallel story line that sometimes takes the reader on a path away from the ark story line. I felt there was, perhaps, too much of an emphasis placed on the budding romance between the characters and the inner turmoil Matt experiences. Carroll does a wonderful job of building interest with the backstory of the lost photographs of the ark. By tying the story of Ann’s grandmother, Jelena, and her friend, Yuri, with the teamwork of Matt and Jim, the author has created a seamless story that spans generations and is a wonderful testament to the timelessness of the ark’s story. I will say I was not expecting the tragedy that occurs centering around Yuri and his family. Carroll presents a moving depiction of Jelena’s love for Yuri and the mystery of his family’s fate. Readers who require action in their historical fiction will appreciate the many close calls and precarious positions in which Matt, Jim, and Ann find themselves. The desire to keep the ark’s existence hidden leads to an all-out battle when one of the terrorists’ operatives infiltrates the ark team. In addition, the entire expedition faces the utter devastation of an earthquake in the middle of their work. Though I loved the premise of the book, references to historical events, and biblical truths, I would have preferred more of a focus on the discovery of the ark itself and less of a concentration on the romance between characters. The hints at the book’s conclusion to the unearthing of the Ten Commandments leaves the reader in the perfect frame of mind to want more from Matt, Jim, and Ann.